Lets talk a bit about German Shepherd tail carriage. Exactly how a German Shepherd Dog carries its tail is very indicative of many things such as its current social standing or its current mental state. Variations can happen, of course, depending upon how your particular GSD carries its tail normally. For example, some German Shepherds may carry their tail higher naturally than others. Just the same way that some people may part their hair on the right and others on the left or in the center. Its just normal for this dog to carry their tail in this way. Here are ten GSD tail positions to help you to begin to understand more about how your dog really feels and sees the world around it. It can also be quite an education to learn what the dog is really thinking or feeling just by interpreting the signals its tail is giving you - and the other dogs around it. 1 - Your GSD is carrying its tail practically horizontal away from its body, but it's not stiff. This tells you that the dog is paying very close attention to what is going on in their surroundings. 2 - If your German Shepherds tail carriage is stiffly, straight out from its body you'll notice that this happens anytime there is an initial challenge such as whenever they first meet a new dog. 3 - If the GSDs tail is carried upward, somewhere between a horizontal or vertical position, this is the sign of a dog that is confident in itself, dominant and feels in control. This is also a display of a dog that is actually asserting his/her dominance. Basically this means "I'm the boss - don't mess with me." If German Shepherd tail carriage is tail high with a crick or sharp bend in it this can also be read as a sign of dominance and aggression. 4 - If the German Shepherd carries its tail upward and maybe even slightly curved over it's back it means, "I am top dog." This is quite the norm for a dog that is confident and/or dominant and one who feels that it is in control. 5 - If your GSD carries its tail lower than the horizontal position but it still has some distance from the legs then you can be assured that your German Shepherd is feeling pretty relaxed. 6 - When your German Shepherd tail carriage is carried in a downward position, much closer to its hind legs it can mean several things such as "I'm a little depressed," "I'm a little insecure" or "I'm not feeling good." 7 - Whenever a German Shepherds tail carriage is tucked between its legs it can mean "I'm scared!" or "Don't hurt me!" Tail carriage like this can also mean, "I'm not out to challenge you." 8 - Additionally, if you notice hair bristling down your dogs back this can also suggests a sign of aggression or potential confrontation. This can also change in intensity if the dog modifies its tail position. For example, if the tail is carried straight out from its body it means "I'm ready to fight!" but if it moves its tail up and over its back it means that "I'm not afraid of you and am ready to fight to show you that I'm the boss." This is extremely serious - especially if it happens between two dominant dogs that don't want to back down. 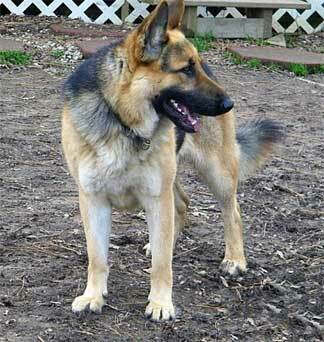 9 - German Shepherds that maintain a broad tail wag often can be taken to mean that "I like you." A dog that has a broad tail wag can also be happy or pleased. 10 - Additionally, if you happen to notice that your dog is now doing a slow tail wag, when it normally doesn't, it could mean that "I'm confused." If you take the time to learn to read your dogs signs, such as subtle things like German Shepherd tail carriage, then you'll be surprised just how much they are communicating to us and to each other. are keen observers of things like body language and will be able to read you long before you will fully understand how to read them. With a little patience and practice and a desire to better understand your dog, or dogs in general, you'll be surprised just how well understanding simple things like German Shepherd tail carriage will help you to read your dog in the future in many ways.